I love the spool pin doilies that I see in pictures of vintage machines and I wanted to make some for myself. There are only a few patterns on the web and they weren't what I wanted. I wanted something that looked like a flower and was easy to make, so I made up my own pattern. They take about 15 minutes to make and I've made enough for all of my machines, even the non-vintage ones. Here's a picture of what it looks like. Use six strands of embroidery floss with a size 1 (2.35 mm) steel crochet hook. Round 1: Chain 4, join with a slip stitch to the first chain to make a ring. Round 2: Chain 3 (counts as a double crochet) and make 11 double crochets in the ring for a total of 12 stitches, join with a slip stitch to the third chain in the beginning chain 3. Round 3: Chain 1, make a single crochet in the first stitch, chain 3 and single crochet in the same stitch, make a single crochet in the next stitch, chain 3 and single crochet in the same stitch, do this in each of the 12 stitches around, join with a slip stitch to the beginning chain 1. Round 4: Chain 1, make a single crochet in the first chain 3 space, chain 3 and single crochet in the chain 3 space, make a single crochet in the next chain 3 space, chain 3 and single crochet in the same chain 3 space, do this in each of the 12 chain 3 spaces around, join with a slip stitch to the beginning chain 1, cut yarn, fasten off, and weave in ends. Thanks ever so much for sharing your pattern. Yours are so pretty. I'll have to make a few for my machines. WOW, thanks so much. I was going to try and make up a pattern for these,now I won't have to! They look great! 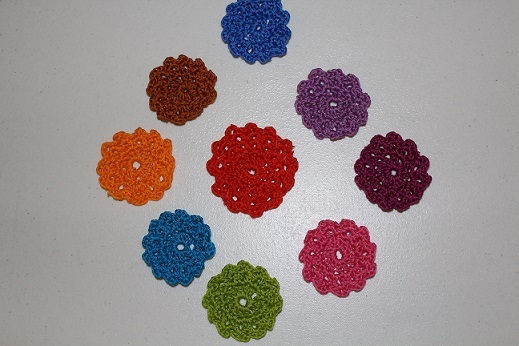 Please forgive my ignorance, but what does a spool pin doily do? I'm nearly certain I've never seen one, and if I did, I didn't know what it was or does. Thank you in advance for your answer. Use your smile to change the world, but don't let the world change your smile. It's mostly decorative and fun. You can replace your red felt disk with a doily if you want or you can just put the doily on top of the red felt. OK, thanks Irishgal. I just finished searching about them, and came back to let you know I had. Yes, mostly a decorative item, however, saves the paint from chipping off the machine, so also useful. I've been wanting to learn to crochet, so maybe this will be one of my first accomplishments. Wow, awesome! I've been wanting to make these also. It's so nice of you to post the pattern. I never thought to make anything like these. Yours are so cute. Thanks for the post and taking the time to give the instructions. No one has explained that this goes under your spool of thread, the little hole in the center fits over the spindle. 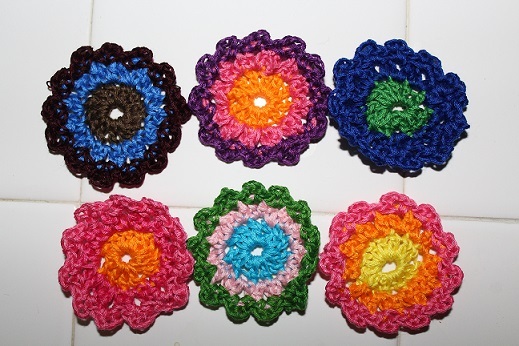 I have made them too, but I make mine a little larger so that the spool doesn't cover all of the pretty doily. Nice job on those doilies. I like the flower look. Thanks for including the pattern. Those are so cute! Thank you for sharing your pattern. I made several for friends of mine last Christmas and used crochet thread. Now I want to make your using the embroidery thread. I went a little crazy the past couple of days and combined some colors. Love these. Thank you so much for posting, as I have admired them. Hope my limited crochet knowledge will be enough to make some for my FW and others for friends. Thanks again as I love yours. These are great! Thanks for sharing the instructions. My grandmother taught my cousins and I how to crochet and we had to practice making these to get our tension in check. Before we knew it we were making a huge table cloth.